Former PhD student Dr Claire Bates was awarded her doctorate in 2015 for her thesis, "Experience of Partner Selection and Relationships for People with Learning Disabilities". This explored how people with learning disabilities find romantic love and form partnerships, what brings them together, and what helps them in maintaining relationships. Following on from this, Claire has launched a 6-month campaign with Choice Support, Supported Loving, championing the right of people with learning disabilities to have love in their lives. Claire’s PhD was funded by Choice Support. Here, Claire explains her campaign and her experiences. "I hope that the campaign will raise awareness of the importance of love to people with learning disabilities, and help people recognise that this is something that everyone should have in their lives. The campaign is based on a key finding from my PhD that people with a learning disability may need support from support staff to find and maintain relationships - from supporting people, to places to meet a potential partner - helping people to organise and go on dates, and helping people to access contraception. "In the 1990s there was a lot of professional attention on sexuality and relationships for people with learning disabilities, but in times of austerity this focus has been lost. We want the campaign to help raise awareness of the importance of good support to help people have relationships, and so we are setting up a 'Supported Loving Network' to allow good practice or innovative initiatives to be shared. "The most heart-warming experience I’ve witnessed in bringing this campaign to life is the story of Neval and Mark. Neval and Mark have been together for more than 10 years. 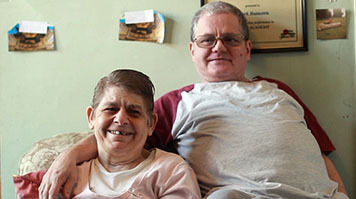 They met at a day service for people with learning disabilities and formed a close friendship. At that time, Mark was living alone, following the death of his first wife. Neval was also living alone, with daily support from staff who provided 24-hour support to people who lived upstairs from her. She’d had other boyfriends in the past who did not treat her well and this had, in her words, ‘put her off a bit’. Mark said he did not expect to find love again after losing his wife. Neval often told staff how lonely she was, sometimes crying because she felt so alone. "When Neval and Mark began a relationship their time spent together was limited, because they lived some distance from each other and Neval does not travel alone. They were very much in love but their relationship could not really progress. Neval’s keyworker recognised this and suggested the possibility of the couple moving in together, and after some discussion they decided that this was what they wanted to do. "Neval’s support staff worked hard to help her move into Mark’s flat in 2006. Neval and Mark still live together and believe this was the best decision they ever made. They no longer feel lonely and each greatly values the companionship of a loving partner. "Neval receives 18 hours' support a week from Choice Support, while Mark receives support from another organisation. The couple have assistance with paying bills, completing forms, cooking, shopping, domestic chores, personal care, housing issues and making and attending appointments. This enables them to remain living together independently. "Their life at home is typical of many couples. Neval enjoys cooking for Mark and takes pride in making sure he eats well. Mark, once a boxer, is physically strong and helps carry home shopping and doing work around the home. They both say how much they enjoy spending time with their extended families, including many nieces and nephews. "The pair are currently looking for a new home, as they need to move due to Neval’s increasing difficulty with the stairs. She says once they find one they can think about getting married, as this had been their long-term dream. "Please support us by sharing us to a wider audience as possible. Follow us and share us on social media (Twitter, Facebook) and our blog. We want any students or staff working with people with learning disabilities who are aware of good initiatives or positive stories in this area to please get in touch." Find out more about studies in Mental Health and Learning Disabilities at LSBU.